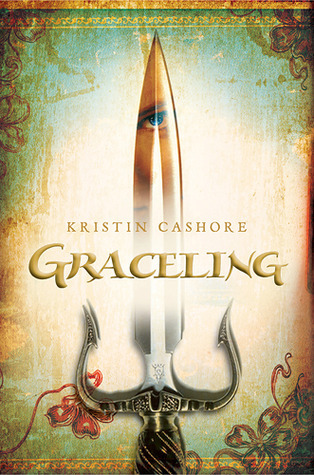 Kristin Cashore’s bestselling, award-winning fantasy Graceling tells the story of the vulnerable-yet-strong Katsa, a smart, beautiful teenager who lives in a world where selected people are given a Grace, a special talent that can be anything from dancing to swimming. Katsa’s is killing. As the king’s niece, she is forced to use her extreme skills as his thug. Along the way, Katsa must learn to decipher the true nature of her Grace… and how to put it to good use. A thrilling, action-packed fantasy adventure (and steamy romance!) that will resonate deeply with adolescents trying to find their way in the world. The reason that I read Graceling was because it was included in The Noob's Guide to Fantasy Reads. And, that it what I am - a noob in the fantasy genre. Indeed, it takes a while getting into fantasy books, and this one is no different. Graceling was a pretty good book, in my opinion. It has a good plot, I love the main characters, and the writing style was good. But the thing is, I felt like it lacked the element of excitement, when I would just turn the page until I got to the last one, pause for a while and process what just happened. With this book, I'm liking it, but I wouldn't mind putting down the book to do other things, and I wouldn't be mad if I was interrupted. Which is why it took me so long to finish the book. However, I still really enjoyed this one. The strong heroine that I always enjoy is present in this book. Katsa definitely is a strong woman, and not just physically. She can stand on her own two feet and doesn't like relying on anyone. She has a pretty great character development in this novel. She started from being enslaved by King Randa, to setting out on her own. From acting on her temper, to learning how to control it. From never letting feelings get to her, to letting go and accepting her feelings. I didn't really like Po in this novel. He always keeps things hidden from anyone, even Katsa, letting others figure things out before he confesses. Sometimes I'm really annoyed at him and I want to beat him up like Katsa wanted to, except I wouldn't know how to and Katsa would. My favorite character from this novel is Bitterblue. She's just 10 years old, but she understands so much. She's a princess, but she's no brat. She's usually quiet, but when help is needed, no one needs to tell her to do so. She's very helpful, strong, understanding, and wise beyond her years. Overall, this was a pretty good book, but it lacks a little bit of excitement. I absolutely adore this series! I really enjoyed, like you said, that Katsa is such an independent character. She's great. I really hope that you continue on with this series. Fire (the second book) is definitely my favorite. Bitterblue is excellent as well. Great review! I've only read the first in this series but I loved it. Bitterblue was one of my favourite characters too! I'm glad to see you enjoyed this one! I read it a few years ago and I remember really adoring it.